Mara has always longed fro a normal life in a normal town where no one has the ability to levitate or predict the future. Instead, she roams from place to place, cleaning the tiger cage while her friends perform supernatural feats every night. When the struggling sideshow is miraculously offered the money they need if they set up camp in Caudry, Louisiana, Mara meets local-boy Gabs... and a normal life has never been more appealing. But before long, performers begin disappearing and bodies are found mauled by an invisible beast. 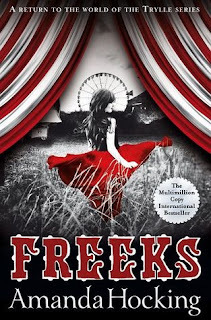 Mara realizes that there's a sinister presence lurking in the town with its sights on getting rid of the sideshow freeks. In order to unravel the truth before the attacker kills everyone Mara holds dear, she has seven days to take control of a power she didn't know she was capable of - on that could change her future forever. I am a huge fan of Amanda Hocking. Her Trylle Trilogy is one of my all time favorite reads. I just couldn't wait to jump at the chance to request this book from Pan Macmillan. And now that I have it in my hands, I just can't wait to jump into this new world that Hocking has created. Thank you so much to Pan Macmillan for sending me a copy of this book! I am anxiously waiting for the perfect moment to read this book. Please note that in no way has receiving this book affected my opinions. All thoughts are my own. Amanda ha definitely not lost her story telling talent. There was good pacing and word structure throughout the book. One moment I was reading the book and the next there was nothing left to read. Amanda definitely has a gift and I wouldn't mind reading her grocery list at this point. I am obsessed with her books. This book was so good! I loved how subtle the story started whilst still giving us, the readers, an idea of what might happen in the story. The story had a good arc and it was towards the end meaning that this book left me wanting more. There was #instalove in this book but I have to be honest. I loved it. I am trash for that trope and I am not scared to admit it. It might be unrealistic but damn it was just really great in this book. These characters are much like Amanda's other characters in terms of how realistic they felt. I really wish that we could have seen a bit more of some of the other characters but in the same note I liked that we didn't. Overall, I LOVED THIS BOOK. It may not have been on her best (considering that I think that the Trylle Trilogy is the best) I loved it. I read this book in about one or two days and I want more. Even if it is just short stories of all the places that the "freak show" have traveled to and will travel to. I just want more. Thank you so much to the lovely people at Pan Macmillan for sending me this book! I appreciate this so much! Great review!! I'm not a big fan of Hocking's writing, but I thought this book was definitely her best yet. So glad you enjoyed it!